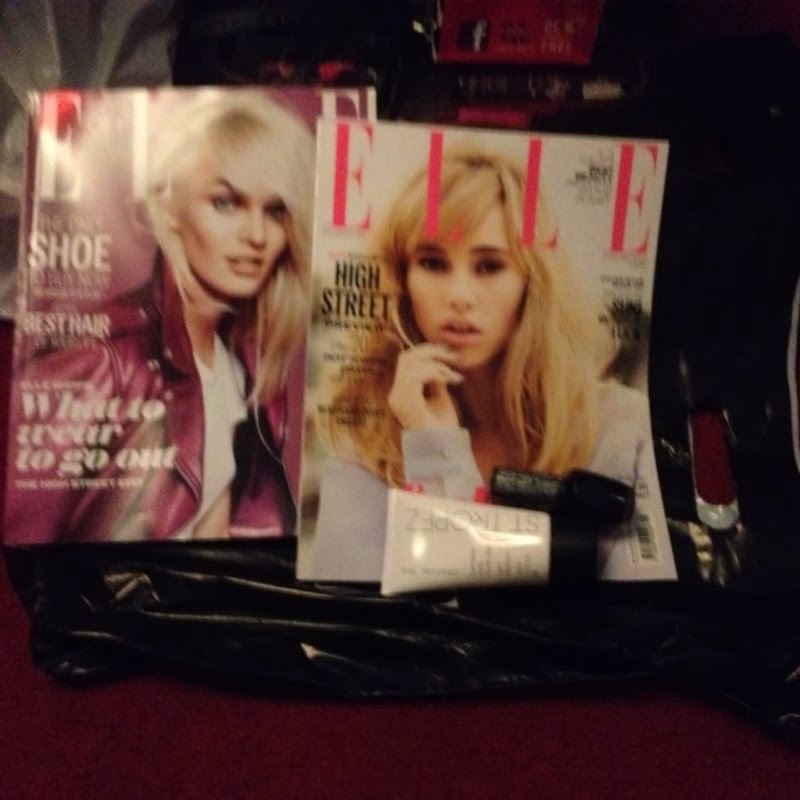 Home » Health and Fitness » Health and Fitness News/Reviews » Active Days Out » The Clothes Show 2013 HAUL and Blog. 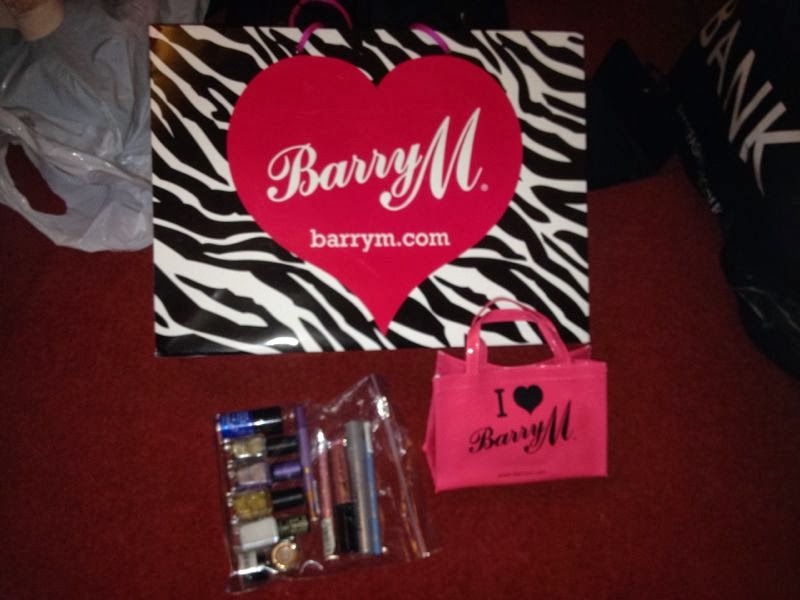 The Clothes Show 2013 HAUL and Blog. I‘m attending with sister, who amazingly had a (gorgeous) baby 2 months ago and still has the energy to shop for 10 hours, my hero.- Taking time to treat yourself is just as important as a healthy diet, healthy in mind healthy in heart. Monday night, i made a pot of veggie pasta, packed fruit, sandwiches and 3 bottles of water. Along with my planned outfit (flat shoes and layered clothes).What i wanted to happen, what actually happened. 8am-8.30 Makeup and hair. Leave for the bus. 8.45 my makeup took a lot longer then i thought. 10.15- Check in my coat and other unnecessary items.She feeds baby. Goody bags first. First and foremost. — Makeup goodie bag offers!! Check in bags and go to the loo. 12.00 Lunch and feed Baby and chill for 30 mins. 5.30 – the theatre. We asked for earlier tickets, they swapped them for 3.00 and helped us to our seats, how ever we had young girls swearing loudly behind us and were not to keen on staying for long. I bought this last year and was unhappy about this again, every year I expect it to surprise me to no avail. A Cosmo magazine *An Andrex portable loo roll. Jelly beans, * a lint chocolate, and a portable loo roll. I bought this last year and have loved ‘st-tropez’ gradual tan. OPI- black crackle nail polish I have never liked this polish however the tan makes up for it. The tan online is retailing for £25 and we only paid £2!! Amazing. · Products * £3.50 worth. I again bought this last year and was happy with it however you don’t get anything substantial from it.The cereal alone costs £2.60 in stores, so the magazine and cereal makeup for the lack of other interesting things in the bag. a horrid drink ‘ raspberry and almond’ that literally made me and my sister gag, we drank the Elle mint drink to get rid of the flavour! 1 box of ‘Dorset cereals’ – pineapple and papaya nutritional cereal. · Price: £2 ***+ Great Value. 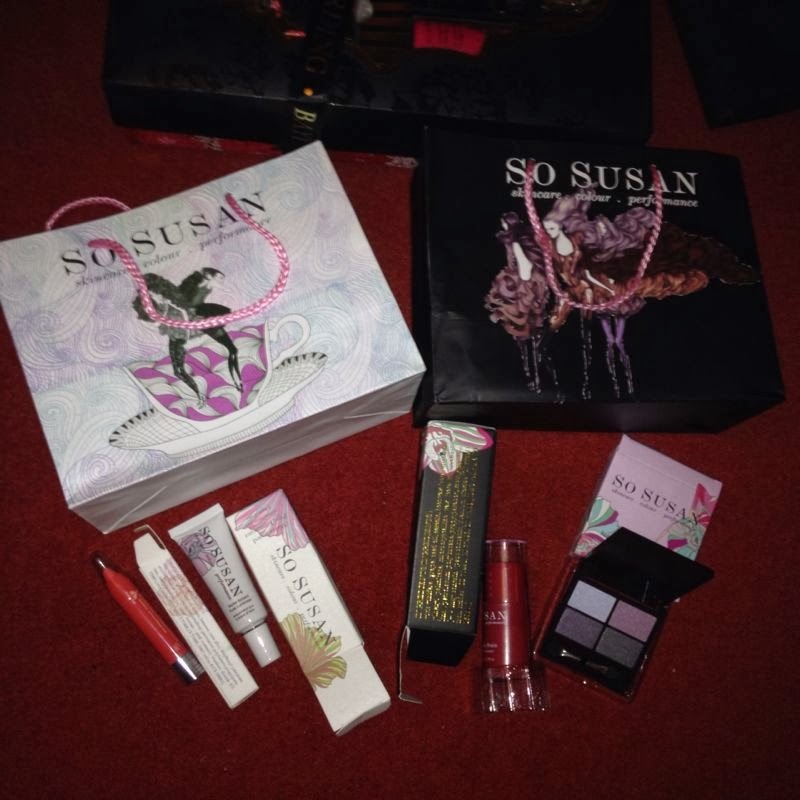 Full product review on so Susan products. 1 purple opaque. *2 dazzle dusts. 120- gold. 91- grey. I could choose any 7 polishes out of 5, inside the bag were also a nail circle for polishes; 3 nail files, 1 nail pencil. 1 toe wedge and 2 20% vouchers! 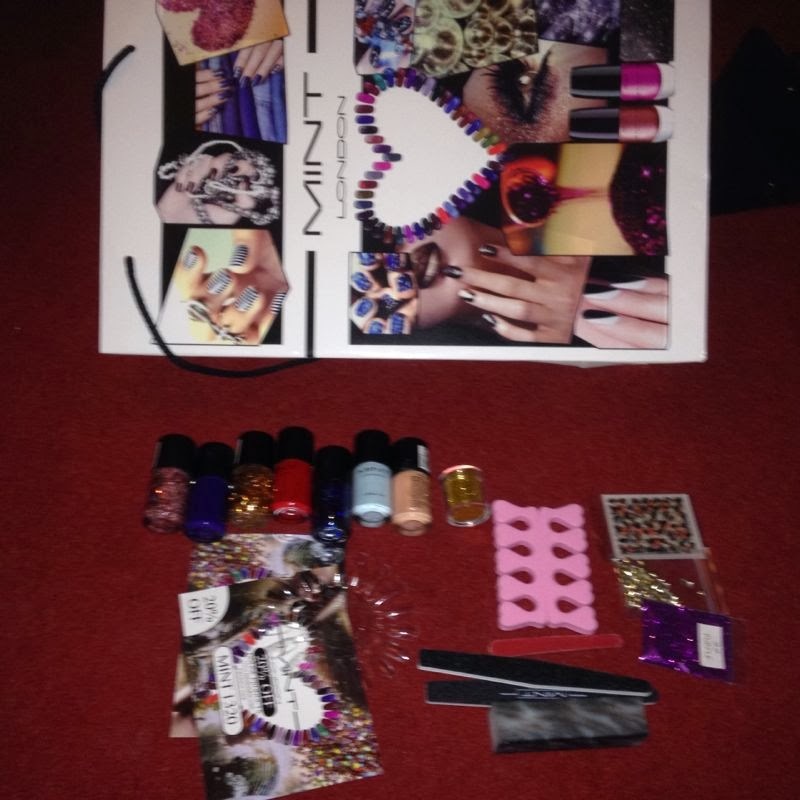 Fantastic colours and bonus items including 2 packets of glitter and nail studs. 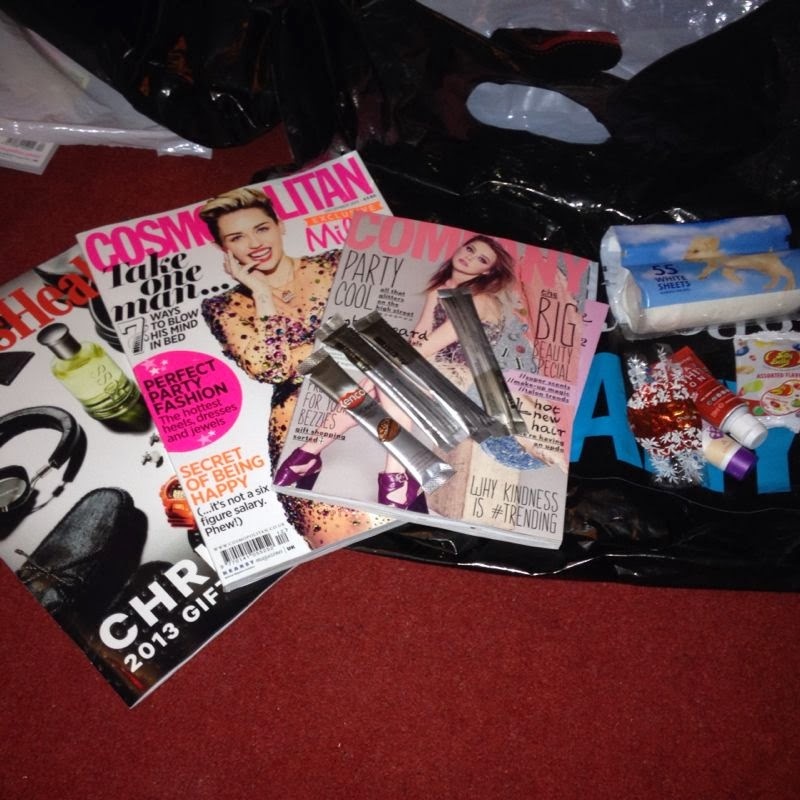 Goody Bag: Subscription to cosmopolitan. 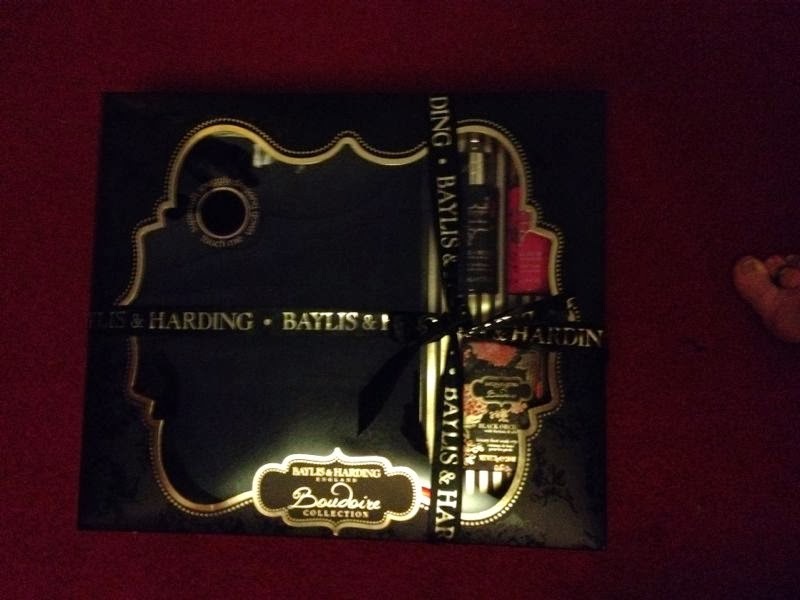 · Price: £12 ***++ Fantastic Value! · Products ***+++ £35, £12, £42 = £89 Worth!! This I walked past, my sister stopped to look at some women writing names down and passing out 1 magazine, so I sighed and played with James. A few moments later she said, that’s amazing do you want one? I knew it had to be so I had a look and sure enough there were really nice things behind the women, I said ‘ it’ll be £30’ for that bronze box Lou, walk away’. We didn’t. We signed up for 1 full year of a magazine of our choice, Elle, cosmos and 2 older women’s magazines. Along with a choice of fake tan or bronze, AND a soft fur bath robe with bath soak, shower wash, foot spa and body lotion. For £12. AMAZING. The gift box didn’t come wrapped but the bronze came with another bag that with a bit of magic, will look amazing. The long walk to the clothes show site was long and full of lifts and alternate routes ast empty halls. However this hasn’t changed. The Trains were appalling; no men helped my struggling sister on and off the trains, let alone give up their seat to her! Midlands trains are disgusting and unorganised I was truly disgusted! The clothes show has also proven to be getting worse each year, the stalls were repetitive and the prices all over priced. Multiple stalls selling the same cheap material dresses for £10,£15 £30! I found a stall selling items from the pound shop for £5, I found a stall selling versions of AX pairs clothing made from cheap polyester fabric for the 20% of the AX Paris prices! One stall sold the same item I purchased last year, a hair remover, and last year I spent £20 on what I can only describe as an industrial size nail file. These items ripped up the skin of the multiple people who have tried it and I’m very unhappy that they have been allowed back to sell these. The stall holders were pushy and rude when told ‘ no thank you, sorry I just bought a bronzer’ and insisted on tutting sighing or just grunting as I turn to leave. A few also served girls they had to stretch across to reach as opposed to me standing in front asking politely. 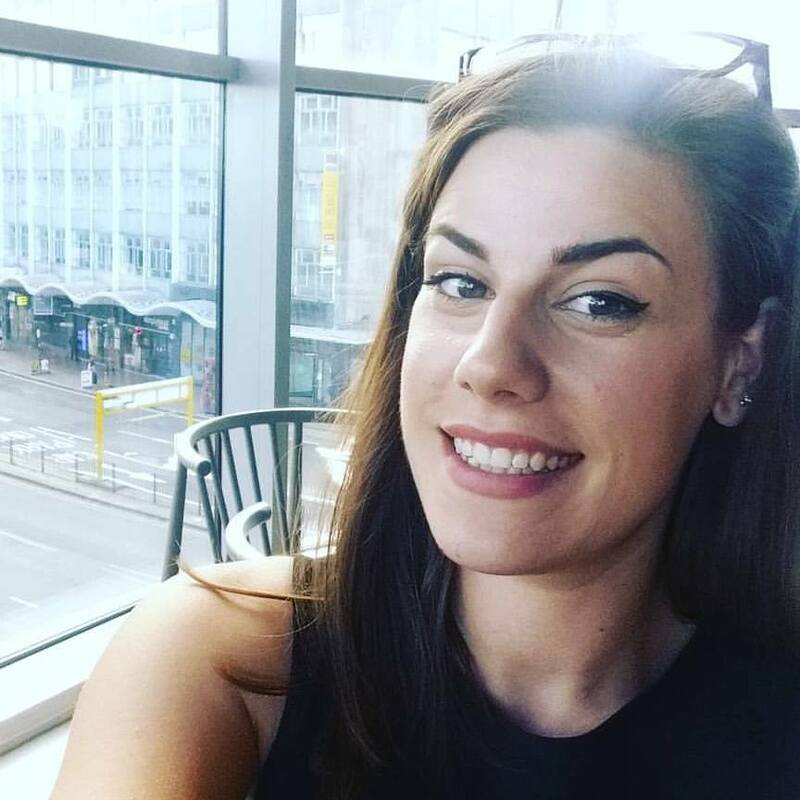 My sister having then noticed he is ignoring my prompts on purpose then enquires how much they are ‘ £79” he says to me, ignoring contact with her- “ oh that is a lot though” – He again ignores her and says ‘ they are great value for money £79 is a bargain’ – we walked away. A lot of the prices were reasonable, but rubbish quality, others were completely overpriced but great quality. I need the best of both if I’m paying £30 to get into a market. You’re buying a ticket to a shopping center!! You’re buying a ticket to a shopping center!! Definitely not worth the money. The staff were amazing, we were lost multiple times and were greeted with friendly faces and helpful staff, many of which walking us through the queue to the front of,; the theater to special seating for the pushchair, cutting through toilet cues and opening the disable toilet and re-arranging out tickets to earlier ones! Today ( Wednesday the 11th) I have nothing more to say on the clothes show, I only need to say the girls are that attended were mostly under 18 and inappropriately dressed, the clothes on sale were cheap and some of last year stock they’re trying to shift – expensively! Overall my day was a stressful waste of time. « The Clothes Show 2013 Is 3 Sleeps away! !